Officially, the war in Laos did not exist; both North Vietnam and the USA denied they had troops there. In fact, thousands of North Vietnamese were invading the country and pouring down the HO Chi Minh trail on their way to the South, and the Americans were fighting a vigorous war against them from the air. 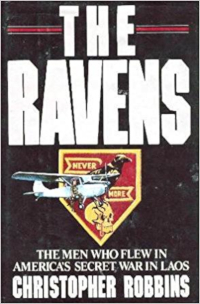 The Ravens were the pilots, all volunteers, who flew through heavy groundfire to identify targets and call in air-strikes. Their mission was top secret. They wore no uniform and carried no identification. Mavericks to a man, they accepted the murderous casualty rates in return for a life of unrestricted flying and fighting. The Ravens did their job with extraordinary skill and crazy courage and a zany humour all of their own. This is their story- a tale of undeniable heroism, blending real-life romance, adventure and tragedy. First published by Bantam Press (Transworld, UK) in 1988. Reissued through Asia Books. ‘Not much has been known about this hush-hush outfit until now. The amazing story of what went on in this part of the secret war (in Laos) is spun out in a fascinating new book. This is a thriller-type war adventure with one significant difference: everything that English author Robbins reports actually happened.